If you're a homeless person with nowhere to go but a city sidewalk, park or other public space, can authorities force you off the street? This week, federal judges again said: "No." That answer — the same given by three judges on the 9th Circuit Court of Appeals back in September — came after yet another review of a case that's been making its way through the courts for a decade. It wasn't a unanimous decision — but a majority of judges rejected Boise's request that the full 9th Circuit reconsider the case. More on what the dissenters said later. As long as there is no option of sleeping indoors, the government cannot criminalize indigent, homeless people for sleeping outdoors, on public property, on the false premise they had a choice in the matter... A municipality cannot criminalize such behavior consistently with the Eighth Amendment when no sleeping space is practically available in any shelter. Bottom line: Criminalizing "life-sustaining" activities on the street — like sleeping or camping — is cruel and unusual punishment, and violates the U.S. Constitution's Eighth Amendment. That language is now binding precedent in the 9th Circuit's jurisdiction — including California and Los Angeles — and it has wide ranging implications for how cities treat their homeless residents. This case originated in 2009 when six people who were then or had been at one point homeless in Boise sued the city after they were cited for violating two city rules: a ban on camping on public streets, and a "disorderly conduct" ordinance that said sleeping in public was disorderly conduct. The core of the Martin case was about how laws created to combat homelessness — at least in the eyes of the lawmakers — were effectively discriminating against people for a circumstance beyond their control. Martin specifically called out Boise's ordinances because it affected what the court called a "life-sustaining" activity required by homeless and housed people alike: sleep. Resisting the need to eat, sleep or engage in other life-sustaining activities is impossible. Avoiding public places when engaging in this otherwise innocent conduct is also impossible. As long as the homeless plaintiffs do not have a single place where they can lawfully be, the challenged ordinances, as applied to them, effectively punish them for something for which they may not be convicted under the [E]ighth [A]mendment — sleeping, eating and other innocent conduct. That is, a city has to make available enough shelter for its houseless residents to legally and practically reside in before it can enforce rules that target "life-sustaining" behavior by houseless people. The basis for that reasoning? Otherwise they have nowhere else but public space to do these things. WHAT DOES THIS MEAN FOR LA? Los Angeles County falls far short of having sufficient shelter beds to house all its homeless. In 2018, there was a total (counted) homeless population of 52,765 people in the county but only 14,970 year-round shelter beds available. Of those, 31,285 people were homeless in the city of Los Angeles, which had 11,081 shelter beds. L.A.'s chronic and highly visible homeless crisis is even cited in the dissenting opinion released Monday, which argued the September ruling was already "wreaking havoc on local governments" throughout the West. And the dissenters took issue with the characterization of the decision as narrow and not dictating that cites must shelter all homeless people. An image of a street in L.A.'s Skid Row is even included in the dissent. The majority opinion criticized the inclusion of the image and argued it actually illustrated why such laws had failed. Rules like the one challenged in the Martin case are commonplace in California cities. A 2016 analysis conducted by the UC Berkeley School of Law found that, on average, California's largest cities had 10 laws that unduly target homeless residents. That analysis broke down the laws into four general categories: those targeting standing, sitting or resting on public property; those barring sleeping or camping in public; anti-panhandling laws; and anti-food sharing laws. In the City of Los Angeles in 2018, at least 1,424 people experiencing homelessness were cited for sitting on the sidewalk, according to the Los Angeles Police Department. 213 of those citations were issued in the 4th quarter of 2018, after the 9th Circuit issued its initial opinion on Martin in September. The question looking forward is how cities will respond to the Martin precedent. 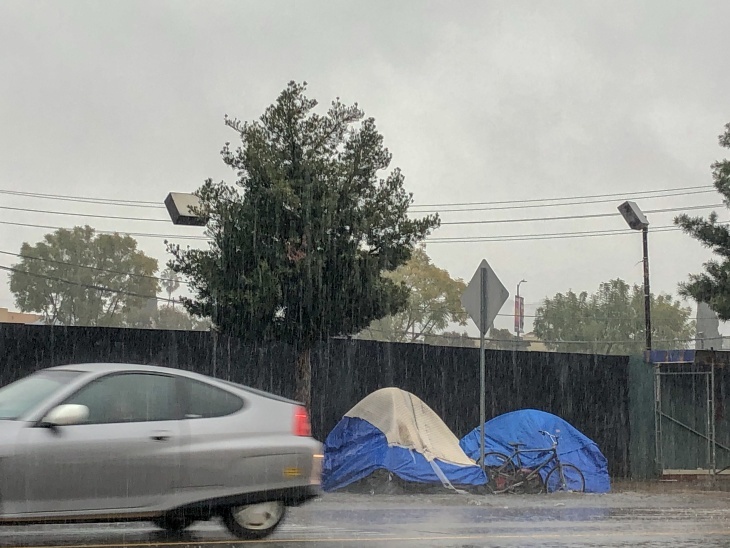 Julia Devanthéry, a staff attorney with the ACLU of Southern California, thinks it may nudge cities to reconsider how they address homelessness — a shift from criminalization to social work. "Cities will have to seriously rethink their ordinances and police practices to make sure they are interacting with homeless folks in a way that's consistent with this decision," said Devanthéry. "The bottom line is the Martin decision is the law, and unless the U.S. Supreme Court weighs in and decides otherwise, it will continue to be the law in the 9th Circuit." Since the ruling last September, San Francisco, Sacramento and Portland, Oregon have stopped enforcing rules affecting sleeping or sitting in public. 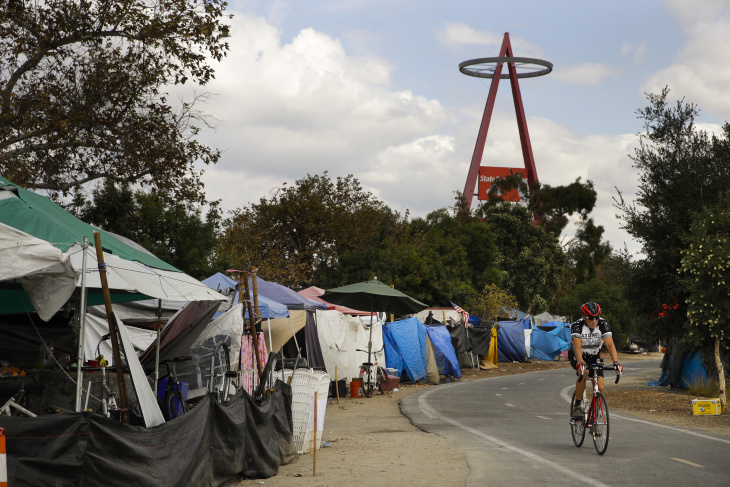 Martin was also cited by U.S. District Judge David Carter, whose 2018 rulings are compelling cities in north Orange County to shelter their homeless residents before enforcing anti-camping ordinances. Another lawsuit was filed against south Orange County cities in February. At the same time, cities could ignore the decision and brace for more litigation. "[Monday's] ruling does not mean the city ordinances are (unconstitutional). It simply has the effect of forcing the matter to be litigated further. Therefore, the city's camping and disorderly conduct ordinances remain in effect until further clarification can be obtained from the courts; the ruling will not cause us to change our procedures."